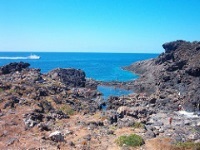 An underwater city and a landscape of petrified black lava are the characteristics of the unusual little island of Ustica in the Tyrrhenian Sea, just a short ferry ride of 36 miles (57km) from Palermo. The ancient volcanic island was once inhabited by the Phoenicians and often fell prey to pirate raids during the Middle Ages; there is evidence of many shipwrecks off the island and the Greeks believed it was inhabited by sirens that lured ships to their doom on the rocks. Ustica has been inhabited since the Paleolithic era and notable archaeological remains have been uncovered. The Phoenicians, Greeks, Carthaginians and Romans all left their mark on the landscape. In the 20th century Ustica became a penal colony but in 1961 tourists officially replaced prisoners. Today, the island is a designated national marine park and its crystal-clear waters and undersea treasures, particularly the submerged ancient city of Osteodes, attract divers from all over the world. The snorkelling is also brilliant, as the waters around the island teem with marine life. Every year in July the island is the venue for an International Underwater Activity Show. Ustica is a delightful excursion which can occupy visitors happily for one to two days, but unless you are an avid diver, you won't need more time than that to explore the island.